It’s obvious even to a casual observer that the team played most casually in the recently concluded Champions Trophy was Pakistan. Not a single victory. The team’s performance was so low that they did not reach even the 200-run score in any of the three matches they played. They scored a total of 502 runs (170, 167, 165) in three games, and the number reduces to 329 if Misbah-ul-Haq’s 173 runs (96, 55, 22) are excluded. While one can fiddle around with figures to further tarnish the team’s already ruined image, it may be better to listen to what experts have to say about the slump. 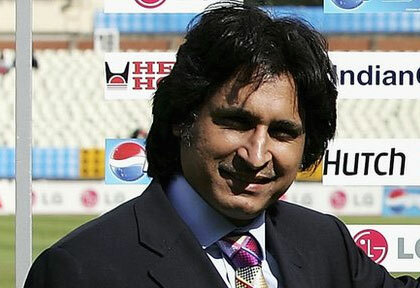 In a recent interview with PakPassion.net, Pakistan former captain and renowned commentator Rameez Raja gave his views about the team’s implosion in the tournament, their preparations and planning for the 2015 World Cup and suggested a few things that may help the national side come out of the crisis it faces. Commenting on Pakistan’s early and disgraceful exit from the Champions Trophy, Raja put blame on the batting which, according to him, has been the team’s Achilles heel. He said the situation is not going to change unless Pakistan introduces drastic changes in the batting structure. He said Pakistan is facing dearth of the talent required to win matches at the international level, particularly in the big tournaments. Asked if he was satisfied with the team’s preparations before the Champions Trophy and the induction of Trent Woodhill as the batting coach, Raja said there was nothing wrong with the preparations, team simply lacked skills, which is why “we’ve been backing or flogging dead horses”. But he declined to give names. He opined that the team’s batting line-up should be revamped as it has been failing to perform in the world events where it is supposed to perform to the full. "The tournaments like the World Cup and the Champions Trophy are the ultimate test of your skills,” Raja said, adding that if a player could not perform at this level after being provided with a good number of chances, then he should not be in team. As for the 2015 World Cup, he said the planning for the event should start as soon as possible, and in all the departments. He gave the example of India that they improved their fielding so much that they have become the benchmark for rest of the teams. He said Pakistan should seek for dramatic changes in their batting line-up, but he said it was a case of hoping against hope. To him, players like Umar Akmal and Azhar Ali can be a glimmer of hope for Pakistan in these times of bewilderment and haplessness. Asked if Pakistan should go for a new captain to replace an ageing Misbah in the coming World Cup, he said it’s a Hobson’s choice. In India, he said, “The Tendulkars, the Sehwags and the Gambhirs have given way to youth and the replacements have been outstanding,” but Pakistan do not have Misbah’s replacement at the moment and it’s depressing. Raja’s career spanned between 1984 and 1997 during which he represented Pakistan in 57 Tests and 198 ODIs, scoring 11 centuries and 53 half-centuries. He continued to render his services for the national cricket after his career and remained chief executive of the Pakistan Cricket Board between 2003 and 2004. He also found fame and fortune as a commentator and is undoubtedly one of the best commentators of the world.